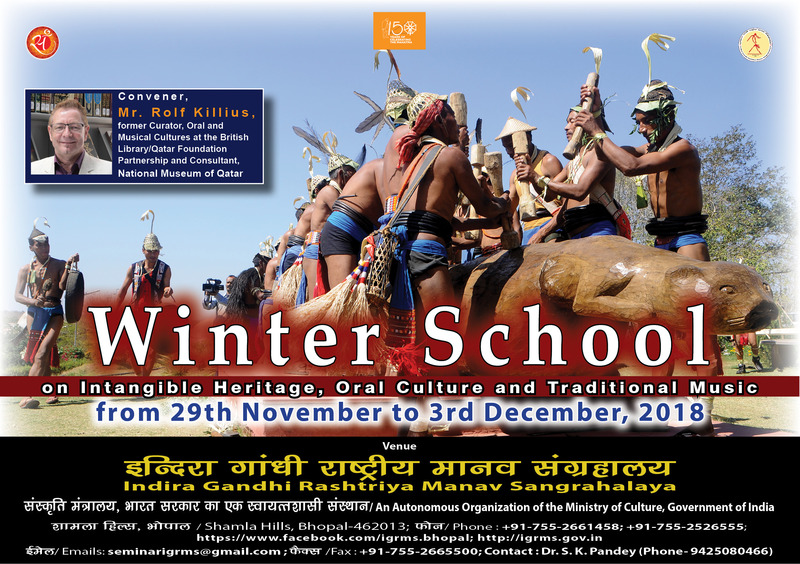 Indira Gandhi Rashtriya Manav Sangrahalaya are organising a five day Winter School on ‘Intangible Heritage, Oral Culture and Traditional Music’ from 29th November to 3rd December, 2018 at IGRMS Bhopal. This Winter School aims to combine theoretical and practical knowledge with no previous experience required. In the first three days the Winter School convener, Mr. Rolf Killius, former Curator, Oral and Musical Cultures at the British Library / Qatar Foundation Partnership and Consultant, National Museum of Qatar, will provide an overview about intangible heritage, intellectual property, copyright, traditional cultural expressions, oral history, traditional music and ethical aspects of recording/filming and documenting people. The fourth day is a practical training session, which includes interview techniques, ethical issues, use of microphones and audio recorder. The fifth day will be a recording event of traditional music and /or oral history. This Winter School is open to all. However, it is expected that participants will have minimum graduate degree in any relevant disciplines/subjects. There are 30 seats for this Winter School and allotment will be purely on first come first serve basis. The registration fee for this Winter School is 2000. Interested participants May apply before 26th November, 2018. For any further assistance the Programme Coordinator, Dr. S. K. Pandey may be contacted on 9425080466.